World Class Resort! Great Value & Convenient, Perfect for Families & Groups. 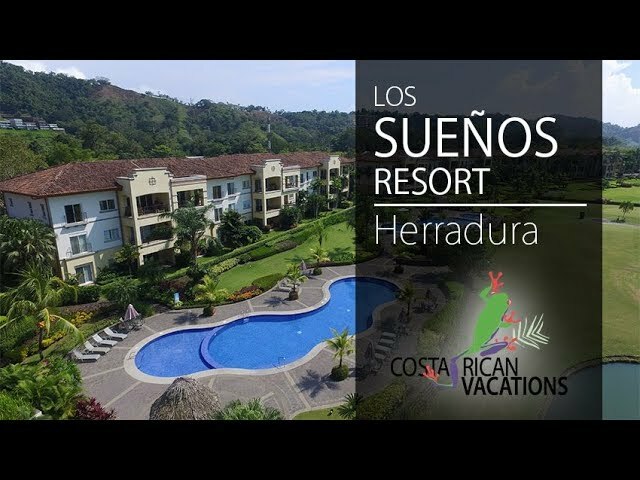 Los Sueños Resort and Marina in Jacó is home to some of the most exclusive private rentals and villas in Costa Rica. Los Sueños offers a variety of high-end vacation rentals where guests have access to resort-style amenities while enjoying the comfort and intimacy of a private home. This location is a favorite among families, groups of friends, and those interested in world-class sportfishing and golf vacations in Costa Rica. Set along over 1,400 acres of lush tropical forests and golden beaches, guests can choose from one-bedroom to three-bedroom condos, or four- to seven-suite private villas, with different elegant designs and modern furnishings. All units are fully furnished with A/C, cable TV, DVD player, fully equipped kitchen, washer/dryer, private terrace or balcony, safe deposit box, hair dryer, towels, and toiletries.Complimentary WiFi access is available in the public areas of the property. Guests have access to 12 restaurants (six located at the Marina and six within the Marriott Resort) Private chef service is also easily arranged with the concierge. The upscale Auto Mercado Supermarket is located just across the street from the community’s main gate. A stay at any of the condos and private villas in the Los Sueños Resort offers access to many amenities including two pools, Jacuzzi, barbecue area, exercise room at Veranda, beach club, Los Suenos Marriott Spa, and championship golf course.The world-class marina on site holds annual fishing tournaments and offers many different sized boats for half-day and full-day tours. Enjoy the two-acre beach club with a well-maintained beach lined with loungers and palm umbrellas. Be sure to hit the pool bar as well for frosty tropical beverages. Los Sueños resort features a spa and 12 restaurants that serve international cuisine. Visit the resort’s exclusive beach club which features a refreshing swimming pool, swim-up bar, and a vast man-made beach. Complimentary fitness classes at the gym. Amenities and service you can expect from a 5-star high class resort. Enjoy hiking, zip line canopy tours, and other activities nearby. The modern Los Sueños Marina is home to the best charters in Costa Rica and hosts three international billfish tournaments every year.